Denis Savard can remember when he first moved to Chicago, dreams of the NHL and winning Stanley Cups dancing in his head. He had 28 goals and 75 points as a rookie in 1980-81, and life was good. He got plenty of ice time and was glad to be a cornerstone for what the Blackhawks hoped would be their first Stanley Cup team since 1961. Fast-forward to September 2007. Savard is in his first full season as coach of the Blackhawks after a Hall of Fame playing career. The organization once again has entrusted the future to his care – and still is chasing that first Cup since 1961. You could say the 47-year-old coach, who was inducted into the Hockey Hall of Fame in 2000 after a brilliant 17-season career as a player, is a cornerstone of a different kind now. One of his jobs is to mold a young team into the Cup contender Chicago has been waiting so long to see. In the minds of most Blackhawks fans, that job begins and ends with the future success of Patrick Kane and Jonathan Toews, the team's first-round picks each of the last two summers who came to Chicago with hopes they would help save the franchise. Toews, a hard-as-nails center and leader beyond his years, was the third overall pick in the 2006 Entry Draft. Kane, a smallish right wing with a flair for creating with and without the puck, was the first overall pick last June. Both possess a vision and sense of seeing the play develop in front of them. From there, they are smart enough to read off one another the way Savard did for so many years with Steve Larmer. Toews is from Winnipeg, went to Shattuck-St. Mary's, the successful prep program in Minnesota, and then had two great seasons at the University of North Dakota. Kane is from Buffalo, played in the successful Compuware junior program in Detroit and then moved to London of the Ontario Hockey League. Despite their different personalities and styles, the two talented rookies' instant chemistry has worked magic in re-connecting with the Chicago fans. 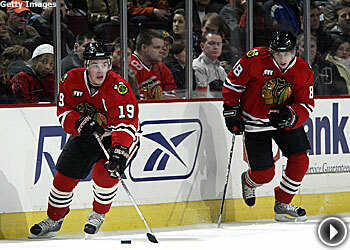 Toews and Kane have been a big hit in their first season in Chicago. They, along with Washington's Nicklas Backstrom, are the leaders in the race for Rookie of the Year. More importantly, Toews and Kane have given the Blackhawks a chance at the playoffs for the first time since 2002. The Blackhawks are back on the map, becoming a vibrant part of the Chicago sports scene that the Bears, Cubs and White Sox have ruled for so long. "These kids are so impressive the way they carry themselves as teenagers," Savard said earlier this season. "They are smart. Productive. They see their futures ahead of them. Most important, they learn from everything around them. They ask questions and just soak up the experience they've had this season. "Some nights they're going to make mistakes. But it's not because of a lack of will or how hard they compete. You can't ask a player – any player, much less kids like this – to play 82 straight great games. It's not going to happen, even though you like to have it. But with these two, they're on pace to play 65-70 really good ones." The team looked lost when Toews missed 16 games with a knee injury suffered Jan. 1. When he returned on Feb. 10, everything on the team improved. "There is a different aura about this team when he's in the lineup," Blackhawks General Manager Dale Tallon said of Toews. "He goes so hard even in the pregame skate sometimes, Savvy has to say; 'Slow down, kid!'" While Toews is a future captain, Kane is the team's heartbeat. "He's got that magic," Tallon said. "I marvel at the way his mind and hands seem to work in unison to find an open man or a great scoring chance. "Put the two of them together and it's like Pavel Datsyuk and Henrik Zetterberg in Detroit. They do things that put a smile on your face." "There's a youthful enthusiasm, a kind of energy,” said Savard. “I think everyone on this team will tell you that they are fun to be around. They come to the rink each day to work and learn. "What is most important to me is they come to work looking for challenges, looking for goals, looking to win." Dominik Hasek covers the puck as Andreas Lilja battles Scott Nichol of the Nashville Predators. Detroit -- Only hats were thrown on the ice, not the Henrik Zetterberg flags that were given away March 19 when the Detroit Red Wings hosted Columbus and Zetterberg scored three third-period goals for a 3-1 win over the Blue Jackets. It was Zetterberg's second hat trick this season and ended a seven-game goal slump. His 39 goals ties his career-high set in 2005-06, and he entered the weekend one point from his career high of 85, also set in 2005-06. … Wings defenseman Brad Stuart will miss the remainder of the regular season and at least part of the playoffs with a broken finger. Stuart, who will become an unrestricted free agent July 1, has turned his season around since arriving in Detroit on trade-deadline day. Stuart was a minus-16 in 63 games with the Los Angeles Kings, but a plus-6 in nine games with the Wings. ... Nicklas Lidstrom's plus-1 and Brian Rafalski's plus-3 in a 6-3 victory at Nashville March 20 gave Detroit's No. 1 defense pairing a combined plus-67 for the season (Lidstrom a league-leading plus-41, Rafalski plus-26). ... The triumph at Nashville gave the Wings 49 wins, just one short of the team's third straight 50-win season, a feat accomplished by just four other teams – most recently the Montreal Canadiens from 1975-76 through 1978-79. ... With power forwards Tomas Holmstrom and Dan Cleary injured, Johan Franzen has responded with nine goals and four assists in a nine-game stretch heading into this weekend. ... Dominik Hasek, who earned the win against Nashville, now has 385 career victories, tying him with Mike Vernon for 10th on the all-time list. Nashville -- After starting the season 20-9-3, the Nashville Predators tied a franchise record with their sixth straight home loss Thursday against Detroit. … Thursday's game marked the 12th time this season Predators coach Barry Trotz has pulled his starting goaltender during a game. … J.P. Dumont had two assists Thursday against Detroit, giving him 66 points, which matches his career high, set last season. … Alexander Radulov scored twice Thursday to snap an 11-game goal drought. ... Martin Erat played in his 400th NHL game in the loss to Detroit. His goal in that contest gave him nine points in his last nine games. ... Jason Arnott's 15-game home scoring streak ended in the loss to Detroit. Blue Jackets goalie Fredrik Norrena stops a shot by Flames' center Wayne Primeau in Columbus' 3-0 shutout victory over Calgary. Columbus -- Manny Malhotra had back-to-back two goal games and five goals in a three-game stretch last week centering the Columbus Blue Jackets' top line, after getting six goals in his first 60 games. ... Fredrik Norrena's first shutout and the 10th by the Predators this season came in a 3-0 victory over Calgary March 18. It was the 32nd shutout by Columbus in its seven seasons in the NHL, but it was the first one in which the Blue Jackets' opponent had fewer than 20 shots on goal. The first nine shutouts this season were by Pascal Leclaire, who was sidelined prior to the Detroit game Wednesday when he was hit in the side of the face by a Fredrik Modin shot during the pregame skate. ... Jan Hejda, one of the less-heralded free-agent signings last summer, was a plus-10 in 10 games going into the weekend since being paired with Rostislav Klesla following the departure of his regular partner, Adam Foote. Hejda is a plus-19 this season. Chicago -- Nikolai Khabibulin said it was fitting that on the night the Chicago Blackhawks honored Tony Esposito the team posted a shutout. Khabibulin stopped 25 shots in a 5-0 victory over Washington March 19. It was Khabibulin's first start since he was sidelined for nearly a month with a back injury. ... Chicago outscored Washington 4-0 in the first period of its win. It was the league-high third time this season the Blackhawks scored at least four first-period goals while holding their opponent goalless in the first 20 minutes. Chicago outscored Phoenix 5-0 in the first period Nov. 30 and Columbus 4-0 in the opening period Feb. 13. The only other NHL team to do it more than once this season is the Los Angeles Kings (twice). ... The game against Washington was a showcase of the NHL's top three Rookie of the Year candidates – Jonathan Toews and Patrick Kane of the Blackhawks and Nicklas Backstrom of the Capitals. In this matchup, Toews scored his 21st goal of the season and Kane had an assist, while Backstrom was blanked. Kane entered the weekend with a 63-61 lead on Backstrom in the rookie scoring race. St. Louis -- Blues center Ryan Johnson leads the League's forwards with 97 blocked shots, 26 more than second-place Chris Drury. ... Back at left wing again, Keith Tkachuk's tip-in of a shot by rookie defenseman Erik Johnson in a 4-3 shootout victory at Montreal March 18 was only the second time all season St. Louis had scored on a 5-on-3 power play. It also was career goal No. 495 for Tkachuk, leaving him five shy of becoming the fourth U.S.-born player – and 41st in NHL history – to score 500 goals. ... Brad Boyes entered the weekend tied for seventh in the League with 38 goals. If he can jump into the top five, he would become the first Blues player to rank that high in goals since Brett Hull finished second with 57 goals in 1993-94. The week ahead – Detroit and St. Louis and Nashville and Columbus will play home-and-home series this week. The Red Wings and Blues have split six games this season; they'll meet March 25 in St. Louis and in Detroit three days later. Nashville holds a 5-0-1 lead in its series against Columbus, outscoring the Blue Jackets, 20-12. The Preds, who host the Blue Jackets March 25 and play at Columbus three days later, have won 13 of the past 14 meetings. ... The Red Wings also play at Columbus March 22. Detroit's 3-1 win March 19 evened the season series at three games apiece. ... Chicago plays at Nashville March 22, at home against St. Louis one day later and then at Columbus March 26. The Blackhawks lead the series against the Predators 4-1-1, with the winning team scoring at least five goals in five of the six meetings.